Unsurprisingly enough, there is no shortage of books and view on the one of the most prominent artists of the modern art era. However, an art historian like T.J. Clark, who manages to entice the recipients to rethink the context of the oeuvre of canonical artists and thereby offering a fresh perspective is rarely to be found. 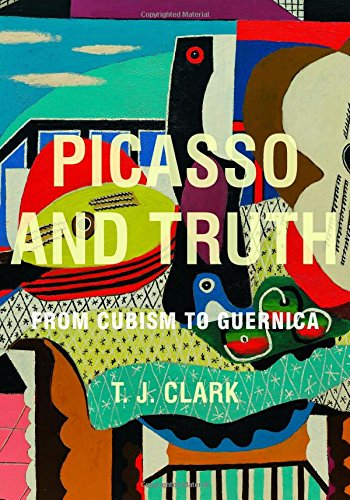 Guided by Nietzsche and with a miniscule approach to analysing contexts and content of Picasso’s emissions from the 1920s-30s, Clark traces Picasso’s range from the light-hearted cubism to the other end of the spectrum, i.e. something more sinister in nature, and infused his elaborations with his wit and an eloquence that peppered with the addition of lesser known titbits about Picasso make it an entertaining read that is analytical yet feels less sterile than other books on the matter. Reading Picasso and Truth is not meant to be a definitely exhaustive interpretation but more of guided tour through samples of Picasso’s both famous and not so much known body of work that serves as the foundation for a discussions on individual paintings, which inspire thought processes. As with all books, one should always put the content into perspective and not read it as gospel no matter how academic the elaborations are portrayed to be, which is particularly the case here when Clark’s tone seems to question Picasso’s artistic merits. Apart from Clark’s lectures on Picasso’s Blue Room, Guitar and Mandolin, Young Girls Dancing in Front of a Window, Painter & his Model, Women by the Sea, the thoughtful and considerate focus of the concluding chapter is centred around Guernica, Picasso's 1937 masterpiece which is on permanent display in Madrid at the Museo Nacional Centro de Arte Reina Sofia. There will never be a singular book that offers a full grasp on an artist of Picasso’s proportions, but Picasso and Truth adds an important stone to the mosaic of an artist that was insistent on denying audiences of his work any interpretation and who made arrogant statements instead. An eloquent book that deciphers Picasso’s complexity with aphoristic, light descriptions, astute observations and insight.